My mother and I have gotten more updates done to the kitchen at the farmhouse we are restoring. 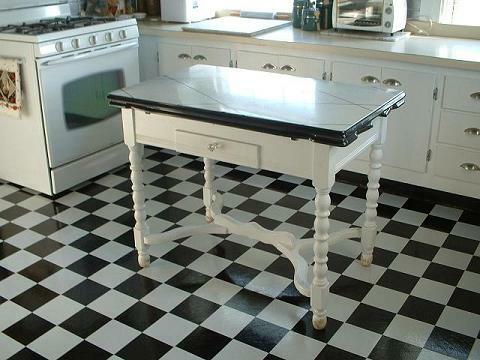 Of all the possible flooring choices, we found this really cool stick-on tile that totally sets off the white kitchen! That’s neat! Can you please say where you got those tiles, and what brand they are? Thanks! As with most of our best finds, the tiles were discovered at a discount/close-out type store and I don’t recall the manufacturer. I can say that after the past two and half years, they have held up pretty well for being very inexpensive and pretty thin.